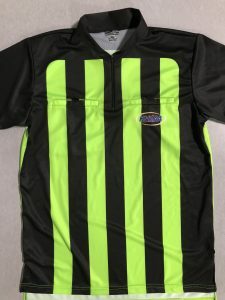 The Kentucky High School Athletic Association worked in conjunction with Smitty’s to manufacture a Soccer officials’ shirt. Below are front/back photos of the finished product. The shirt will be required for all postseason play in 2018. The shirts may not contain logos or identifying patches other than the logo of the manufacturer or an optional American flag. Official safety green and black shirt with KHSAA sublimated logo on left front below pocket. Officials must match. In other words, in the regular season, you could not have two officials with Option 1 and one with Option 2 doing the same contest. 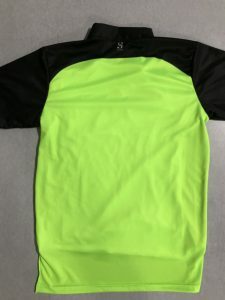 For all contests in 2019, Option 2 shall be the only approved uniform shirt.